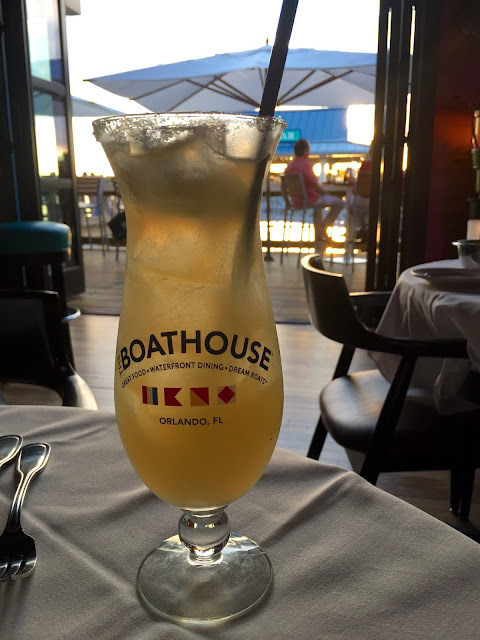 Last Sunday for Father's Day, we took Gabe's Dad to see Jurassic World at Downtown Disney, followed by an early dinner at The Boathouse inside of the new Disney Springs expansion. This was our first time experiencing Disney Springs and were very impressed. Downtown Disney suffered for many years after the fall of pleasure island. If The Boathouse is any indication of the future of Disney Springs, it will quickly be the new "it" destination in Central Florida. It's slated to be completed by 2016 and offer 150 shopping, dining and entertainment venues. The Boathouse is a family friendly waterfront dining experience whose menu is served daily until 2am. They feature steaks, fresh seafood, a raw bar and the best Maine Lobster roll you will find in Florida - more on that later. There is also a dockside bar which offers the best view in all of Walt Disney World. The Boathouse also offers various water adventures from a Wooden Italian Water Taxi, Lady Rose Antique Steamboat Tour for two, and the below shown Amphicar Tour, a car that drives on land and floats in the water! You could spend your entire evening walking around the dock checking out their rare ship collection. There are 19 rare and beautiful boats gathered from museums, private collections and boat shows. Here is a sample of what you will find at The Boathouse Disney Springs. Now it's time to talk food! I am a born and raised Floridian who grew up on the beach. It goes without saying that fresh Seafood has always been a huge part of my life. My family has property in Maine and whenever we visit, I find myself eating nothing but Maine Lobster (specifically Lobster Rolls) the entire time. I also don't fit into my shorts by the team we head back to FL. While I am not a New Englander, I do consider myself a Lobster Roll connoisseur. We did not have reservations for Boat House and it was 6:00 on Fathers Day - but we took a chance and scored seats in the lounge area right at sunset - so I apologize for my photos. The sun was not agreeing with me. I told you the sun was not cooperating with me. Don't let the photo fool you - this was the best friend shrimp I have had in a very long time. The Fried Baja Shrimp were coated in Panko and fried. They were literally the size of prawns and we devoured them. Gabe's Mom ordered the Surf Clam Strips. I am not much of a fried clam strip kinda girl - until this day. I have no idea what The Boathouse did to these clam strips, but they changed my "I hate clam strips" to "I want more right now". There's also a great wine and cocktail list at The Boathouse. We were all very impressed with this restaurant and will be coming back soon. They do not yet take Tables of Wonderland or Annual Passholder discounts but hopefully that will be changing soon. You can now make reservations for The Boathouse on Open Table and find them on Facebook to keep up with current events!